Receiving gifts is wonderful and everyone loves it. It does not matter what the occasion is, we all love to receive new things. It might be for Christmas, graduation, wedding or a birthday, it doesn't really matter. When receiving gifts, there is usually some kind of party involved. Wouldn’t it be nice if you had a cool looking storage for the gifts you receive while having a party? Of course, you could put the gifts on your table, or in some spare room you do not use. But, what if you could have something really different as a storage for the gifts you receive? Wouldn’t that be nice? That’s where White Postbox from Quality castles comes in. It is a traditional British postbox, and you can store the gifts you receive in it. It is perfect for gift cards as well, and not only that, you can use is as a beautiful decoration too. It is very appealing and can be used for many different occasions. It could be used for any event that gifts might be given. It also has a window where you can put a photograph of the person whose birthday you are celebrating, or details of the event taking place. If you don’t want to put a photograph, you can insert a card with the information of the event being hosted. The White Postbox has a key and a lock, so you can be sure that your gifts and cards will be safeguarded at all times. When the party is over, you can simply open it and take out everything you have received. We all know just how rewarding and enjoyable reading the gift cards can be. 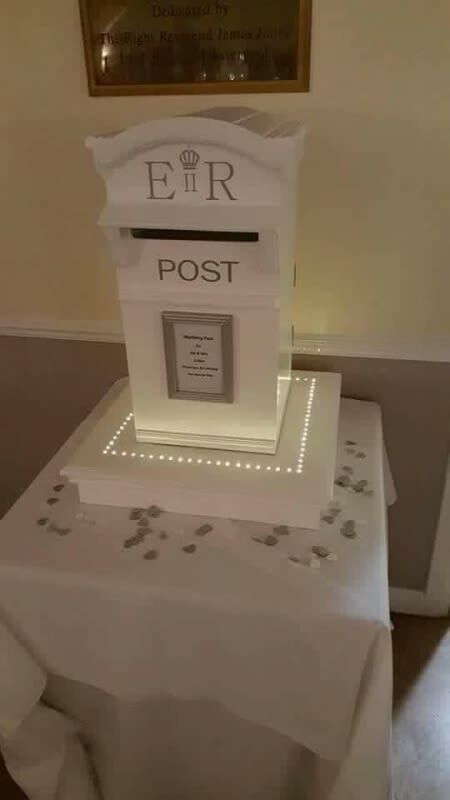 Make your party unique by renting one of White Postboxes. If you are concerned about the installation, don’t be, we will do all the work, all you have to do is give us your address, when you want it and how long for and that’s it, you are done. Each postbox costs £50 per day, and you can rent if for a longer period as well. You can use the postbox in an indoor area, and you can book it online, there is no need for driving all the way to see us. Everything is handled online, unless of course, you wish to pay us a visit. We’ll be delighted to meet you in person. Quality Castles also offer a huge array of other party essentials, such as bouncy castles, kids bouncy castles, sumo suits, domes, castles with slides, just to name a few. If you are looking for a new approach to your upcoming celebration, you are in luck. We offer everything you need for a perfect celebration and more. Feel free to give us ring, send us an email or to browse through our web pages to find more useful information, or instead, you can use our contact us page and we’ll answer any query you may have. We answer promptly and read every request we receive, so don’t be a stranger and let’s talk!